In 1969, the Septuagesima season was removed from the liturgical calendar and its three Sundays and two week days were absorbed into Ordinary time. Even though I was raised a Catholic and attended Mass for years before the liturgical calendar was changed, I only heard about Septuagesima maybe six years ago, and I’m still finding out what it means. For me, as I’m sure is true for others, writing about a subject is the best way to learn about it. It’s a rich topic, and I can just barely scratch the surface, but here goes with a little introduction to Septuagesima, for those who live in an ordinary time world or those who, like me, worship according to the traditional calendar, but just haven’t been paying attention. Continue reading this article at Dappled Things. 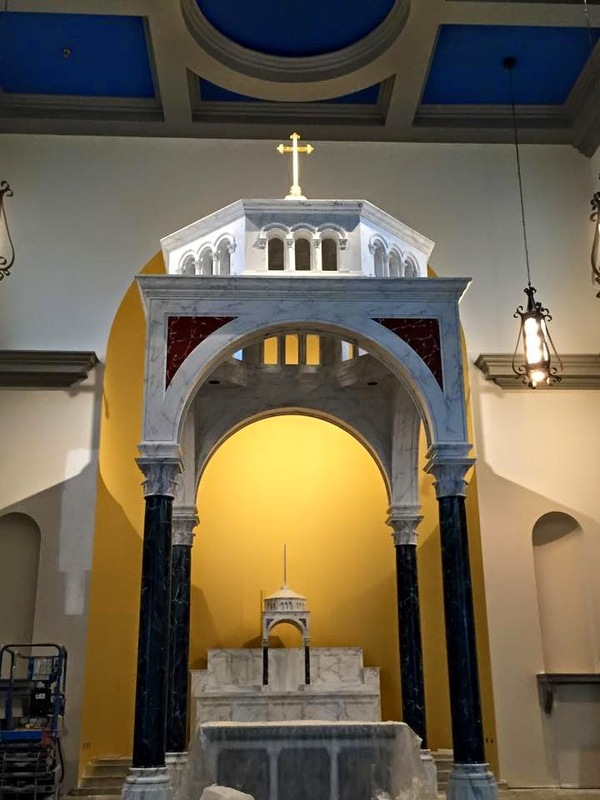 . .
As we reported last week, the church of St Mary, Help of Christians in Aiken, South Carolina, will be dedicated next Monday, the feast of Candlemas, by His Excellency Robert Guglielmone, Bishop of Charleston. The architectural firm that designed the church, McCrery Architects, and Fr Gregory Wilson, the pastor, both sent us photographs of various parts of the church building, the decorations and furnishings, which you can see by clicking here; the whole project is worth seeing as an example of a brand new church which is built in complete respect for the Catholic tradition of sacred art and architecture. McCrery has just sent me several photographs of the various phases of the project to design and build the altar, (a project which took about 11 months from initial idea to execution), which I am happy to be able to share with our readers. 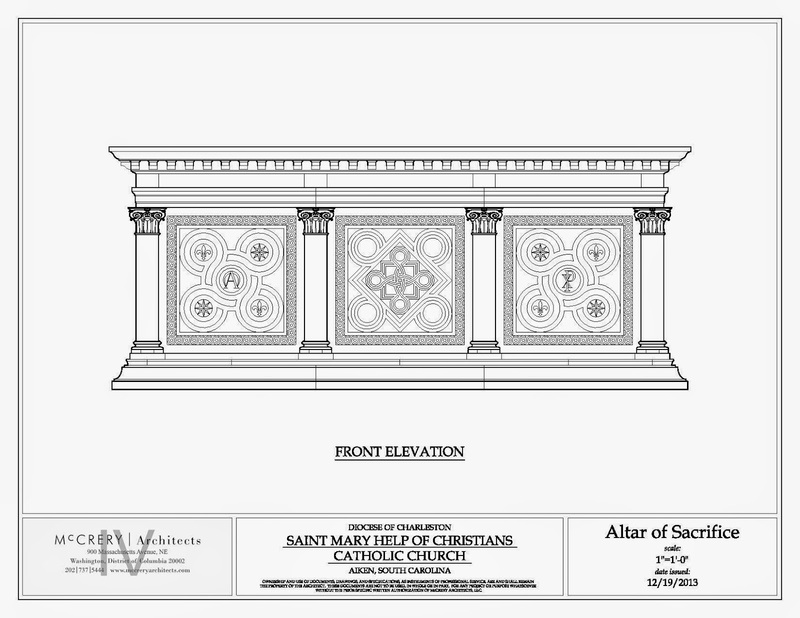 The final approved drawing for the altar design. 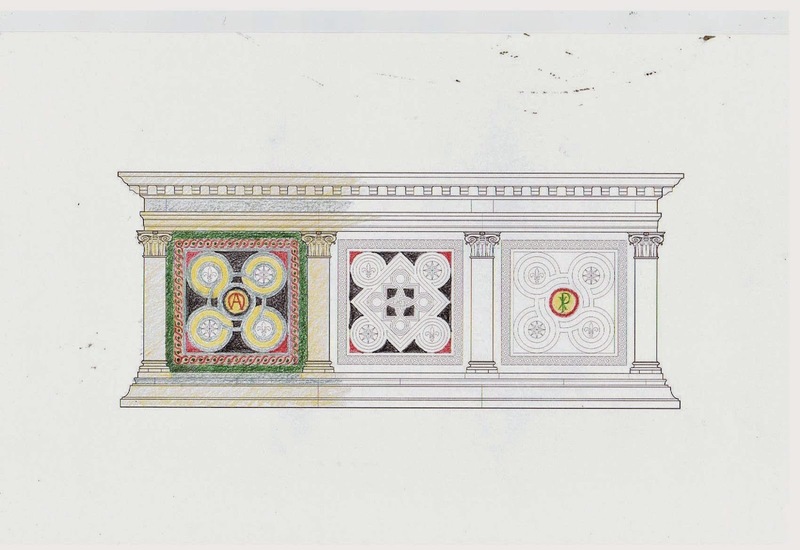 The seven species of marbles employed in the altar. The one on the upper left was later replaced with a much whiter specie that forms the body of the altar and mensa. Color studies using color pencils, which are later sent to the fabricator’s shop. Fabrication begins: small inlay pieces cut by computer-guided water-jet now ready for assembly. For those in the London area who have a love of Gregorian Chant, or would like to learn more about it, I'd encourage you to check out this event which will be held in a little over a month. The next meeting of the Gregorian Chant Network will take place on Saturday 14th March, 2015. 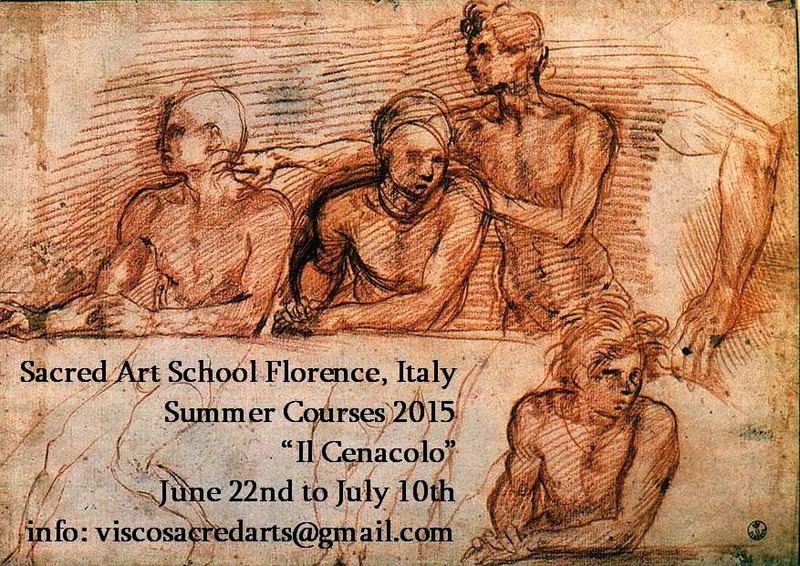 For the first time it will be open to all. Directors of chant groups registered with the GCN will get a discount. We will be addressed by Daniel Saulnier, former choirmaster at Solesmes, and Giovanni Varelli, Cambridge researcher who discovered the manuscript of the earliest written polyphonic music, which will be performed at the meeting. The meeting includes lunch, for those who want it, and concludes with Vespers, followed by tea. Prices: Directors of scholas and chant choirs which are members of the Gregorian Chant Network: £10 including lunch. Others: £10 without lunch; £25 including lunch. 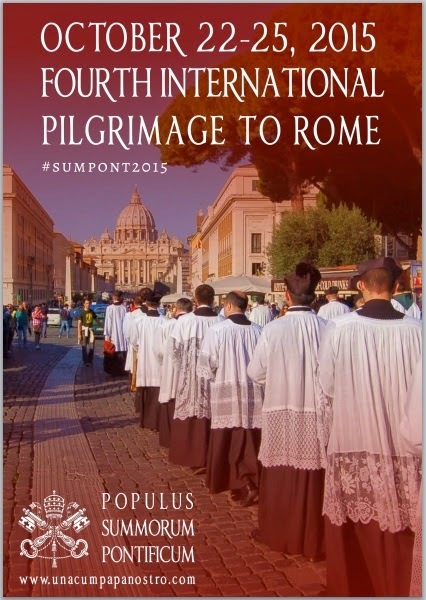 The Latin Mass Society is hosting a booking page here. 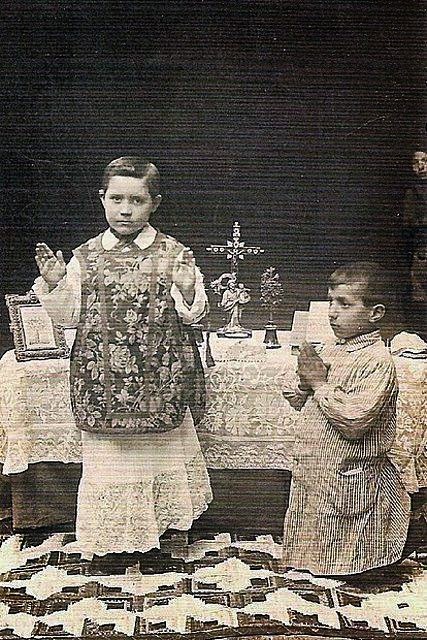 Yesterday I posted an old photograph of a young boy dressed as a priest and playing at saying Mass, with another boy acting as his server. I had originally thought to contrast it with the following video, as an example of how the practice of children “playing” at the liturgy is still, God willing, fostering vocations and devotion even in our own day. I had seen the video on facebook some time ago, but its title is in Russian, and I couldn’t track it down in time for yesterday’s post. 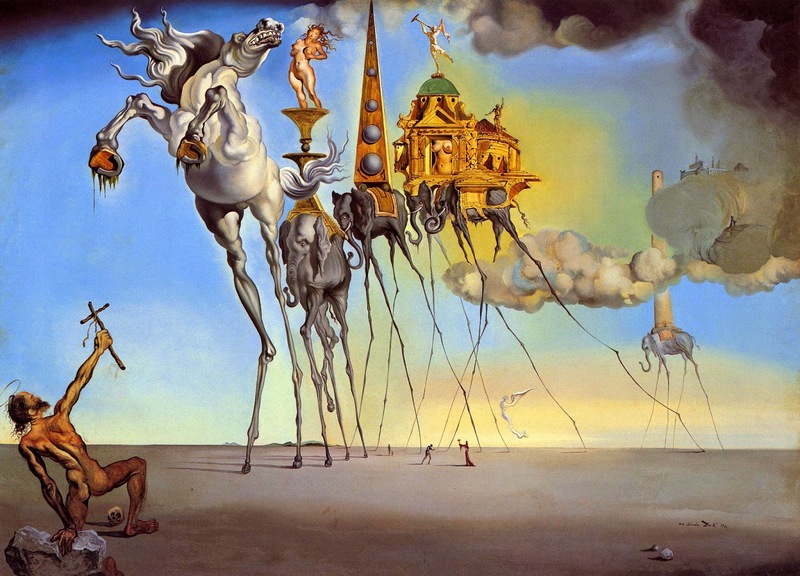 I am therefore very grateful to reader James Badeaux for giving a link to it in the combox. Note, by the way, that these children are not playing at celebrating the Eucharistic liturgy, but Matins, complete with incensations. (There is so much we Romans can learn from the East!) The “anointing” (with glue, it seems) is a part of the Byzantine Great Vigil service held on Saturday evenings and the day before the major feasts. The celebrating priest paints a cross of rose-scented oil on the foreheads of the laity, who each kiss his hand. However, the other priests present each take the brush from the celebrant, and paint the oil on their own foreheads; the celebrant and the priests kiss each others’ hands before and after. Also note, therefore, how at 1:53 the boy in the red hat correctly acknowledges his brother’s sacerdotal dignity by kissing his hand and giving him the brush. (Slightly missing the point, he later kisses his own hand.) At the end, the smaller one blesses the people and says, (as one does towards the end of every major Byzantine service) “Mir vsyem - Peace to all!” And with thy spirit, little brother! 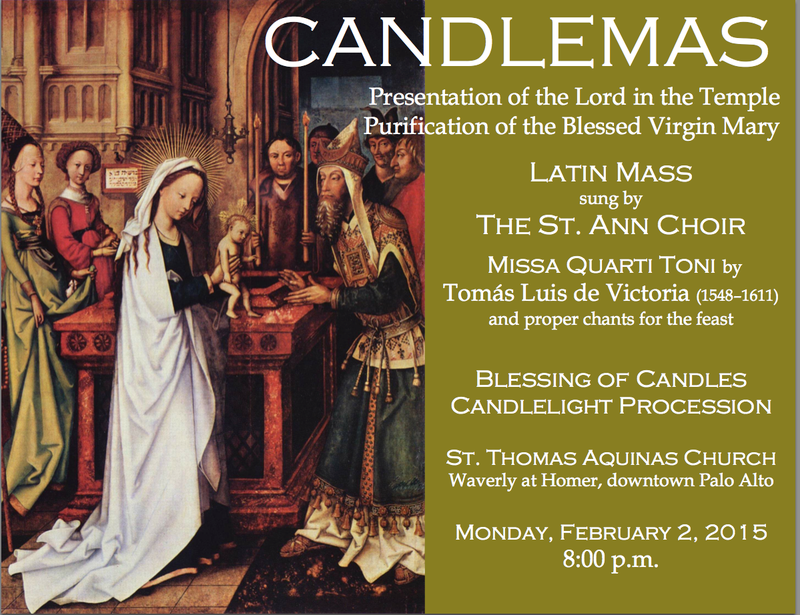 On Candlemas, the St. Ann Choir, directed by Stanford Musicology Professor, William Mahrt, (President of the Church Music Association of America, and Editor of the journal Sacred Music), will sing the Missa Quarti Toni by Tomás Luis de Victoria, along with the propers for the Feast. The Mass will be followed by the Blessing of the Candles and a Candlelight Procession. The Ordinary Form Mass will be sung in Latin at St Thomas Aquinas Church in Palo Alto, California, at the address and time in the poster below. We are very pleased to offer to our readers this excellent article by Paweł Milcarek, an account of some important aspects of the Liturgical Reform before Vatican II. Dr. Milcarek is a Polish philosopher and historian, founder and director of the journal “Christianitas”, (published thrice annually; see also christianitas.org), the author of several studies about the liturgical reforms in the 20th-century, and the critical editions of Vatican II documents. He lives in Brwinów near Warsaw, with his wife and six children. This article will be published in two parts. One hundred years have passed since the “Liturgical Movement” appeared in the Church: within some milieus – not very numerous, but fairly active – the desire arose to make the piety of the faithful as a whole more grounded within the communal prayer of the Church. This movement has always shown a certain longing for the Middle Ages, the period when liturgy was indeed a model for all prayer, and the liturgical year constituted the main calendar for Catholics. But the real motive behind the creation of this movement was not nostalgia, but an anxiety based on a rather sobering diagnosis: the divorce between the inherited liturgical forms and the piety of the masses of the faithful, a process characteristic of the late modern period, had caused this piety first to break away from its objective model within the Church, and then to break up into numerous particular services, and sometimes simply to degenerate or burn out. 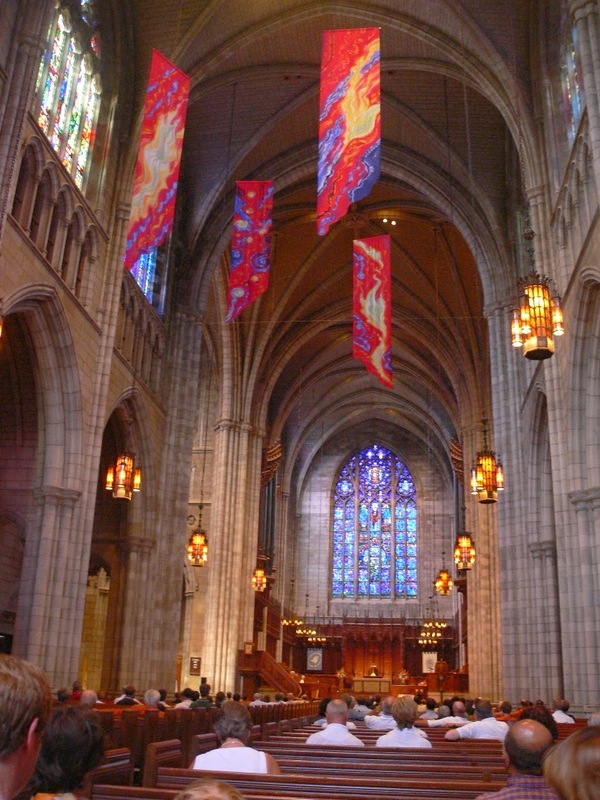 The fact that personal piety was in practice narrowed down to private prayers and spiritual exercises made it easy to regard the social dimension of life as in a way neutral, no longer under the influence of religion, opening it to increasing “colonization” by secular ideologies of both the left and right. In this statement – taken from a booklet that expands upon the theses of his famous paper given at the Malines Congress in 1909 – there is of course a tension between the announcement that “substantially nothing will change” and the call to “enrich the life of this organism.” This tension was the starting point for various proposals that oscillate between the desire to transform the liturgy fundamentally (in its human aspects), and a determination to transform the pastoral care of the faithful, so that it could adjust itself to liturgical tradition. The real context of the modern liturgical movement’s formation was of course the Church’s liturgical life, which for centuries had been determined by the Tridentine order of the liturgy. However, when we speak of the Tridentine order of the liturgy, we are using a mental shortcut. The resolutions accepted at the Council of Trent did not lead to the creation of a new order of worship within the Catholic Church. The Popes who implemented the post-Tridentine liturgical reform, first among them St. Pius V, simply brought into general use an already-existing standard of Roman liturgy, with fairly small modifications. The Tridentine order of the liturgy is almost identical with the pre-Tridentine Roman liturgy, and preserved an incontestable and clearly visible continuity with its medieval and Gregorian form, and through them, with the very beginnings of the Roman Rite. Among the elements of the Tridentine reform, one must note the far-reaching Romanization – or rather papalization – of the Latin liturgy, which permitting the whole Church of the Roman rite to use the Roman books, with exceptions in respect for acknowledged particular traditions; the centralization of power, which made the management of liturgical issues an exclusive prerogative of the Papal administration (1); and the precise legal codification of liturgical texts in typical editions. We must also note the proclamation that this codified form of the Roman liturgy represents its “pristine” shape (2); an inaccuracy which, deriving from the Renaissance’s fascination with the “sources” of all things, can now be seen as the time-bomb that would explode into “archaeologism”, as the rationalistic cult of “the sources” intensified. Furthermore, alongside the inclination to “regulate” the development of liturgy exclusively through rubrics, propers and calendar, we see the growth of paraliturgical devotions that were supposed to make up for this “stiffening” of the liturgy. As mentioned above, an important aspect of this Tridentine reform of the much older liturgical tradition was exclusive Papal authority in the field of liturgy. (3) This factor – introduced at the request of the Ecumenical Council – successfully protected the Roman rite from deformations that could have resulted from its adaptation to new and various “modern” trends. However, has this protective factor itself not been subjected to some deformations, precisely under the influence of modern ideologies? Already at the time of St. Pius X, the Popes’ sovereign authority started to show a tendency towards liturgical absolutism, a tendency in contrast with the principle that authority consists in guardianship of what has been entrusted to it. This absolutist tendency prevailed in some cases of primary importance, such as the major reorganization of the Breviary by St. Pius X, or, to an even greater extent, the reforms of Pius XII to the text of the Psalter and the Holy Week services. The paucity of references to liturgical tradition as such in Mediator Dei underlines the emphasis on the prerogatives of “authority” even more strongly, granting it the status of the first principle of the liturgical order. Of course, we must also bear in mind that this emphasis derived from a desire to tame some of the unrestrained experimentation of the liturgical movement. Still, if we describe this as a kind of absolutism, we must also note that it strove to be an enlightened absolutism, exercised in consideration of the researchers’ achievements and the experts’ opinions; provided, of course, that the latter respect the Popes’ supreme authority. Long before the Second Vatican Council, the promise of a general reform of the liturgy began to blossom in the encounter between the highest authority that “fixes the principles”, and the researchers who “present or indicate” the issues. To some extent, this was happening without regard for the context of Tradition, or the principles of the organic development of liturgy. A document of special importance for the analysis of the reformers’ intentions is the Memoria sulla riforma liturgica, a text drawn up in 1948 by the Historical Section of the Congregation of Rites, then reviewed by the consultors, and further discussed by a special commission appointed by Pius XII to prepare a general reform of the liturgy (the so called Pian Commission). (6) The document was confidential, and indeed became a point of departure for the reforms undertaken by Pius XII. Later on, the members of the commission on the liturgy of the Second Vatican Council had access to it. Giving a reason for the reform of the liturgy, the Memoria begins with a statement that the liturgy suffers from a number of problems, such as an overcrowded calendar, too many octaves, the complexity of the rubrics; and all this is said to diminish the love of the priests for the Liturgy. Hence there arises “a desire for a reform that would bring about a sensible simplification and a greater stabilization of the liturgy”. Fortunately, the development of liturgical studies allows “a solid revision of the Liturgy on a broad and secure basis in [liturgical] science”. Therefore, it is possible to fulfill the desire, reinforced by the Liturgical Movement, to free the liturgy “from certain accretions that obscure its beauty and diminish in a certain sense its efficacy”. After briefly summarizing earlier projects to modify the liturgy, fundamental principles of future reform are presented in no. 15 of the Memoria. The first of these says, “The opposed claims of the conservative tendency and the innovative tendency must be balanced.” This first principle is later developed in no. 16, where so called archaelogism, (7) on the one hand, and innovativeness, (8) on the other, are indicated as two unacceptable extremes. Now, a wise reform of the Liturgy must balance the two tendencies: that is, conserve good and healthy traditions, verified on historico-critical bases, and take account of new elements, already opportunely introduced and needing to be introduced. Since the Liturgy is a living organism ... so the Liturgy, which is a continuous manifestation of ... religious vitality [of the Church], cannot be something set in stone; rather, it must develop, as in fact it has developed, in parallel line with all the other vital manifestations of the Church. Hence, it is the task ... of the liturgical reform to balance ... the just demands of the opposed tendencies, in such a way as not to change through sheer itching for novelty and not to mummify through exaggerated archeological valuation. To renew therefore, courageously what is truly necessary and indispensable to renew and to conserve jealously what one can and must conserve. It is easy to sense the appeal for some restraint and prudence behind these words – but it is the balance that seems to be a central notion here. And balance is always about allowing the opposing forces to act, in order to sustain some object, which would otherwise literally loose its balance. The authors of the Memoria are aware of the fact that there exist “opposing tendencies,” and their counsel is to balance them through a “wise reform”. Interestingly, the things to be balanced are the notions of change and of preservation – while pastoral care for “liturgical participation”, so significant within the Liturgical Movement, is not even mentioned here. The balance of “forces” seems to prevail over the harmony of the whole entity. footnotes: 1) This principle derives from authorization delegated by the Council of Trent in the Decree on the Index of Books, on the Catechism, Breviary, and Missal, 4th December 1563. 5) “It follows from this that the Sovereign Pontiff alone enjoys the right to recognize and establish any practice touching the worship of God, to introduce and approve new rites, and also to modify those he judges to require modification. Bishops, for their part, have the right and duty carefully to watch over the exact observance of the prescriptions of the sacred canons respecting divine worship.” (Pius XII, Mediator Dei 58, emphases added). Although the Christian names most commonly used in reference to Mozart are “Wolfgang Amadeus”, he was actually baptized as “Joannes Chrysostomus Wolfgangus Theophilus Mozart.” The first two of these names were chosen for the feast day on which he was born, that of St John Chrysostom, which was universally kept in the West on January 27th until the calendar reform of 1969. “Wolfgang” was the name of his maternal grandfather, while “Theophilus” was one of the names of his godfather, Johannes Theophilus Pergmayr, a name which is Germanized as “Gottlieb” and Latinized as “Amadeus.” He was baptized the day after his birth in 1756. St John Chrysostom died on September 14, 407, at the city of Comana in Pontus (in the north-central part of modern Turkey) while travelling into exile, banished at the behest of the Empress Eudoxia by her husband Arcadius. Over thirty years later, their son Theodosius II, as a gesture of penance for his parents’ injustices against the Saint, had John’s relics translated from their original burial site to the church of Hagia Irene (Holy Peace) in Constantinople. Since he died on the Exaltation of the Holy Cross, his feast day was appointed for November 13th, and is still kept on that day in the Byzantine Rite; the Byzantine Calendar also marks the feast of the translation of the relics on January 27th, whence his traditional Roman day. I have a copy of the Hieratikon, a priestly service book for all the main functions of the Byzantine Rite, printed in 1977, an official publication of the Orthodox Church of Greece; in the Calendar, the feast of his Translation is marked as one of a fairly small number of “red letter days,” but the November 13th feast is not. The Byzantine Rite keeps on January 30th a feast with the imposing title (again, from my copy of the Hieratikon) “Our Fathers among the Saints, the Great Hierarchs and Ecumenical Teachers Basil the Great, Gregory the Theologian (i.e. 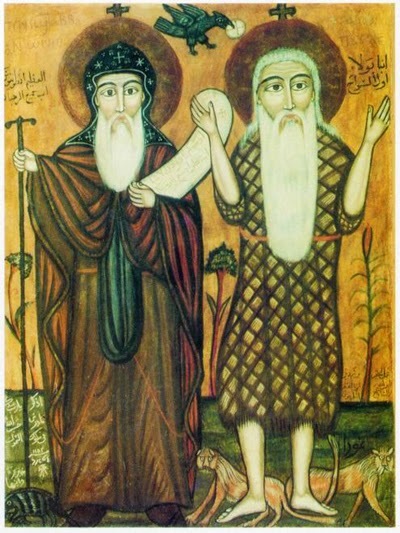 Gregory of Nazianzus) and John Chrysostom.” This commemoration arose from a vivid dispute in the 11th century as to which of the three should be regarded as the Church’s greatest theologian and teacher, a dispute in which people formed parties that called themselves “Basilians” (not, of course, in reference to the religious order), “Gregorians,” or “Johannites”. 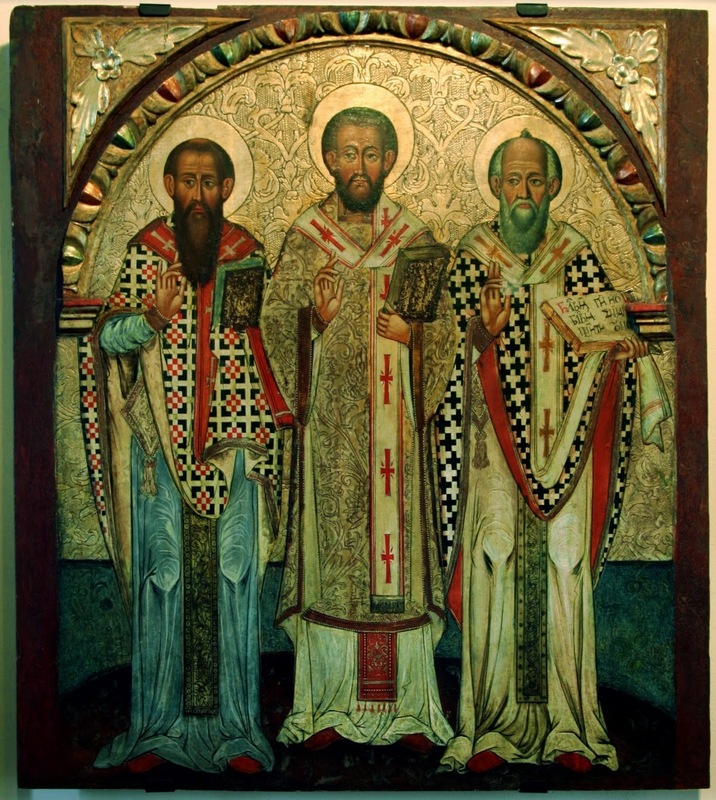 It was resolved when all three Saints appeared to John, bishop of Euchaita (a city fairly close to where Chrysostom died), saying “There are no divisions among us, and no opposition to one another.” The Byzantine Calendar keeps the feasts of St Basil on January 1st, and Gregory Nazianzen on the 25th, the days of their respective deaths; therefore, the principle feasts of all three, as well as their joint commemoration, all occur within the same month. Along with St Athanasius, all three were declared Doctors of the Church by Pope St Pius V in 1568. St Basil shares his Byzantine feast day with the Circumcision; the structure of the Byzantine Rite permits the celebration of more than one feast on the same day, without really “reducing” any of them to a mere commemoration, as is historically done in the Roman Rite. This was clearly not an option in the West, which therefore assigned his feast to June 14th, the day of his episcopal ordination. January 25th is the Conversion of St Paul in the Latin Church, and so St Gregory was historically kept on May 9th, a week after St Athanasius, whose mantle he inherited as the greatest theological writer in the controversies over the Trinity and Incarnation. In the beautiful Byzantine custom of giving distinctive epithets to the more important Saints, he shares the title “the Theologian” with St John the Evangelist. 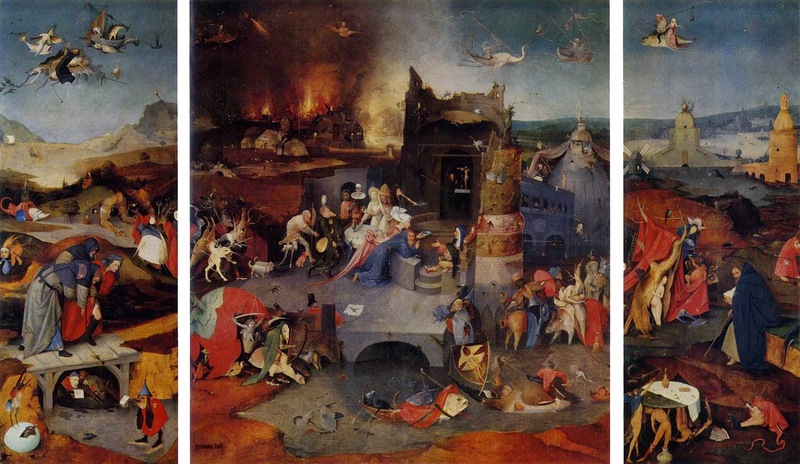 While the tradition of keeping the Saints’ feasts on the day of their death is certainly very ancient, and for that reason alone laudable, it was frequently applied with more zeal than wisdom to the Calendar reform of 1969. One could hardly keep St Basil as a mere commemoration on the newly-created Solemnity of the Mother of God, which replaced the Circumcision in the Roman Rite, even if commemorations still existed. He and Gregory were therefore given a joint feast on January 2nd. Chrysostom, on the other hand, was moved from January 27th to September 13th, the day before his death. It is perplexing, to say the least, why any of this was thought necessary, especially in an age purportedly so concerned with ecumenism. 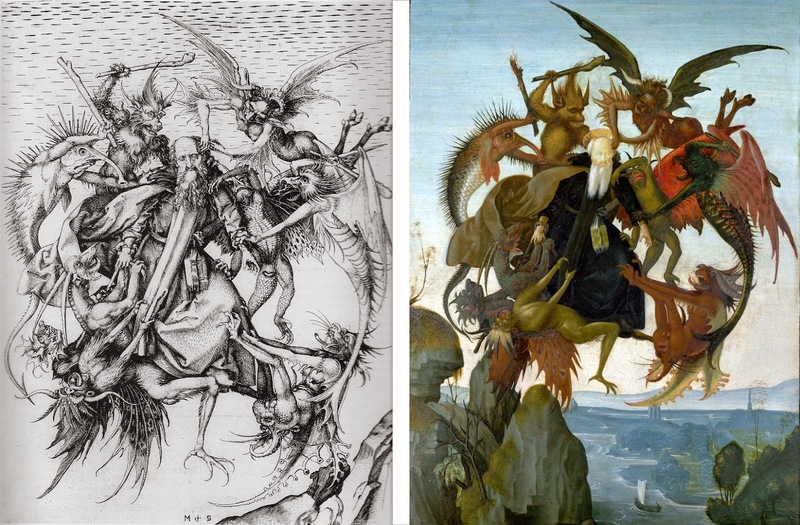 The final result of these changes is that none of these Saints keeps his traditional Western day, not even the one shared by the East; none of them moves to his Byzantine feast day; and none of them moves to his death day. Each January, Wyoming Catholic College freshmen spend a week in the vicinity of the Grand Teton mountains near Jackson, learning how to live in the wintry outdoors, cross-country skiing with backpacks, building quigloos and quinzees, and generally getting comfortable (or as comfortable as possible) with the cold, quiet, and beautiful world of deep winter. I won't say much more about the winter trip or the outdoor program with its experiential leadership component; interested readers can find out more here and here. What I'd like to post on today, instead, is an amazing "competition" that took place on this year's winter expedition. Because they knew the two College chaplains would be traveling from site to site to celebrate Mass, the students challenged one another's groups to build the ultimate snow altar for the occasion. (Credit for the initial idea goes to Mr. Rob Meeker, Assistant Director of the Outdoor Adventure Program.) And, as the photos show, they outdid themselves. 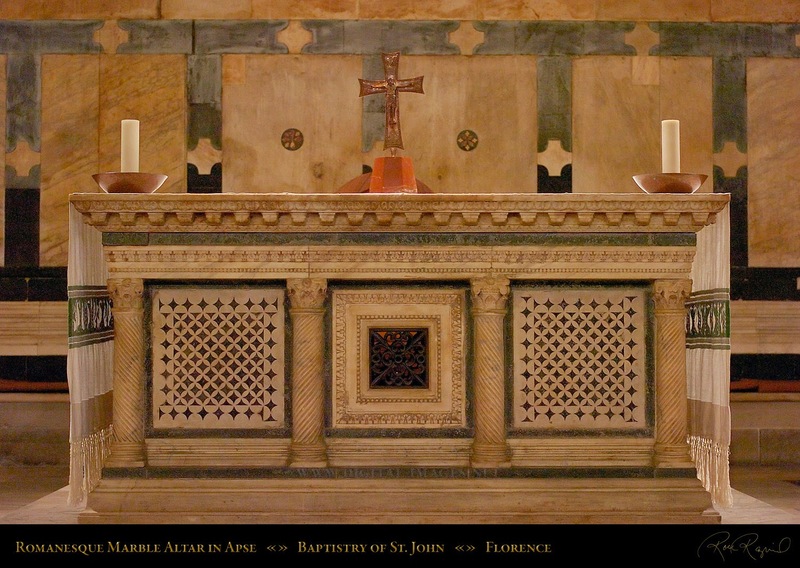 Altars weren't enough; they built chairs, pews, altar rails, and other furnishings, and decorated them with Latin phrases. One of the photos shows Fr. Christopher Saliga's Byzantine altar cloth that he carried with him so that he could celebrate Mass upon the relics of saints. Congratulations to the freshmen of the College for their creative adaptation of the plentiful God-given ice and snow, so that the Holy Sacrifice of the Mass could be fittingly celebrate even in the remote wilderness. How can one not be reminded of the verse of the Benedicite: "Benedicite, rores et pruina, Domino; benedicite, gelu et frigus, Domino, laudemus et superexaltemus eum in saecula. O frost and cold, bless the Lord; O ice and snow, bless the Lord: praise Him, and exalt Him above all for ever." I'll post the photos according to student groups -- there are five different Masses (and therefore five different "sanctuaries") shown here. The sanctuary -- with altar, altar rail, chair, and ambo. Getting ready for Mass. Where has the sun gone? A new kind of monastic cowl? There's even a statue of Our Lady. I have just seen a report that Fr Richard McBrien has died after a lengthy illness. (Also here, at the website of Notre Dame University, where he formerly taught.) Fr McBrien was a prominent presence in the American Catholic world from the 1970s on, often called upon by the media to comment on Catholic issues. He was also a prominent dissenter from the magisterial teachings of the Church, and promoter of other dissenters, such as Hans Kung and Charles Curran. 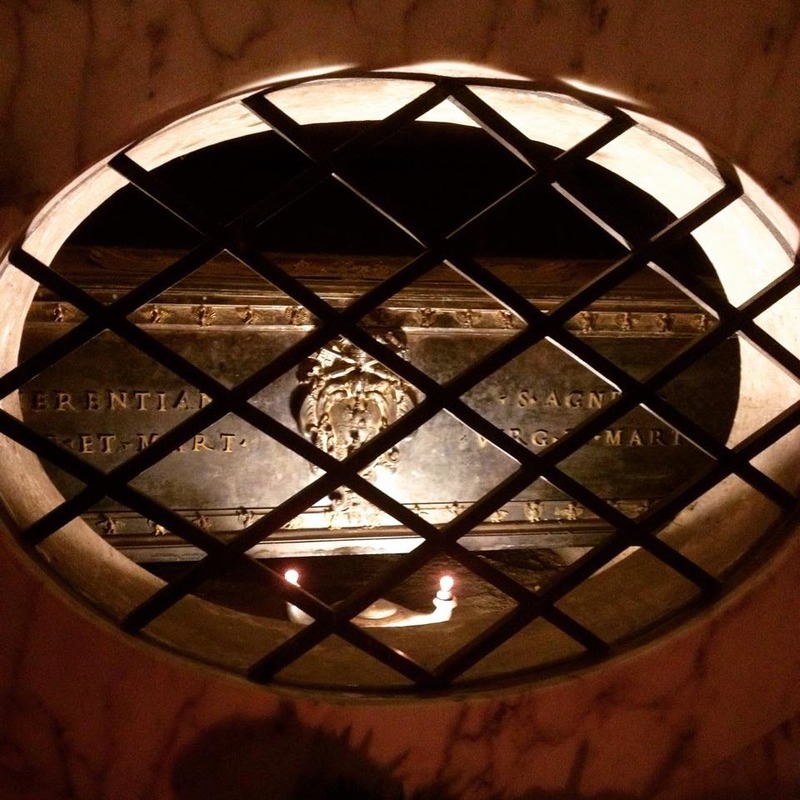 Pray for the repose of his soul, in Latin. Celebrating the Votive Mass of the Marriage of the Blessed Virgin Mary with Saint Joseph, we contemplate anew the great mystery of God’s immeasurable and unceasing love for us. In the brief account from the Gospel of Saint Matthew, we see how God provided that His only-begotten Son be incarnate in the immaculate womb of the Virgin Mary and at the same time, by His Incarnation, become part of the family of Joseph and Mary. In other words, although Saint Joseph and the Blessed Virgin Mary had married before the virginal conception of God the Son in Mary’s womb, they did so with full respect for the consecration of Mary’s virginity to God from her youth, the offering of her virginity to God for consecration. In other words, Saint Joseph had married Mary with the intention to honor, throughout their marriage, her consecrated virginity. From the text of the Gospel according to Saint Matthew, it is clear that Mary was already married to Saint Joseph at the time of the Annunciation, but that Saint Joseph had not yet brought her into his home. For that reason, upon learning of her pregnancy, Saint Joseph, for the sake of decency, thought to divorce her in as discreet a manner as possible. To be clear, the word “betrothed” is not rightly understood as “engaged,” but rather as “espoused” or “married,” as the rest of the language of the text makes clear. According to Jewish custom, marriage took place in two stages: first, the legal, or true marriage was celebrated, and then, only after a certain period of time, the husband brought the wife into his house. Thus, before he lived with Mary, Joseph was already her husband. Mary is indeed the spouse of Saint Joseph and, therefore, the Divine Child conceived in her womb by the overshadowing of the Holy Spirit is a member of the family of Joseph and Mary, and enjoys the divine maternity of the Virgin Mary and the foster-fatherhood or guardianship of Saint Joseph. The Bibles inexactly translate “engaged,” while Mary is really married to Joseph in keeping with the two phases of Hebrew marriage: the consent (qidushin) before the Annunciation, and the second phase, the introduction of the wife into the house of the husband (nissuin), in accord with Joseph’s agreement to a virginal marriage (non-consummated). - (Marie, source directe de l’Évangile de l’Enfance). For he who finds me finds life and obtains favor from the LORD; But he who misses me injures himself; all who hate me love death. Contemplating the Marriage of the Blessed Virgin Mary with Saint Joseph, we see how, at the very beginning of the work of salvation, God the Father took care that the conception of His only-begotten Son in our human flesh be virginal, as it indeed must be, but, at the same time, completely legitimate, so that it manifest fully the truth, beauty and goodness of God. God the Son is virginally conceived in the womb of Mary, Wife of Saint Joseph. The Gospel according to Saint Matthew is marked, in particular, by attention to the juridical nature of our faith and its practice, presenting Christ as the New Moses, the New Lawgiver, most eminently in the Sermon on the Mount. It is inconceivable that God the Son, at His Incarnation, would not respect fully, indeed would not bring to perfection, both the virginity of the Blessed Virgin Mary and the sanctity of her marriage to Saint Joseph. The erroneous position described above is held not only by those who knowingly dissent from the constant teaching of the Church but also by many individuals who are simply poorly catechized and therefore fall prey to such false teaching. The teaching of Christ on Holy Matrimony shines forth with particular splendor in the marriage of His Mother Mary and His Foster-Father Joseph. We are about to witness the great victory of the Cross, the great work of God the Son Who took our human nature in the immaculate womb of the Virgin Mary. Christ now sacramentally offers the Sacrifice of Calvary. He gives us the incomparable fruit of His Sacrifice: His Body, Blood, Soul and Divinity. He gives us the Heavenly Medicine and Food by which we overcome sin in our lives and live in true freedom for love of God and our neighbor. May our contemplation of the Mystery of Faith in the marriage of the Blessed Virgin Mary with Saint Joseph inspire us to teach, to celebrate, and to live the truth about Holy Matrimony, as God established it from the beginning and redeemed it through His saving Passion, Death and Resurrection. May we seek always in the Eucharistic Mystery the grace so to teach, so to celebrate, and so to live. The earliest known practical example of polyphonic music - a piece of choral music written for more than one part - has been found in a British Library manuscript in London. Written using an early form of notation that predates the invention of the stave, ... (t)he piece was discovered by Giovanni Varelli, a PhD student from St John’s College, University of Cambridge, while he was working on an internship at the British Library. He discovered the manuscript by chance, and was struck by the unusual form of the notation. Varelli specialises in early musical notation, and realised that it consisted of two vocal parts, each complementing the other. ... the piece is also significant because it deviates from the convention laid out in treatises at the time. This suggests that even at this embryonic stage, composers were experimenting with form and breaking the rules of polyphony almost at the same time as they were being written. Nicolas Bell, music curator at the British Library, said "This is an exciting discovery. When this manuscript was first catalogued in the eighteenth century, nobody was able to understand these unusual symbols. We are delighted that Giovanni Varelli has been able to decipher them and understand their importance to the history of music." British Library MS Harley 3019, with the polyphonic antiphon Sancte Bonifati. Image from the original article. The video below shows the piece being performed by Quintin Beer (left) and John Clapham (right), both music undergraduates at St John’s College, University of Cambridge. 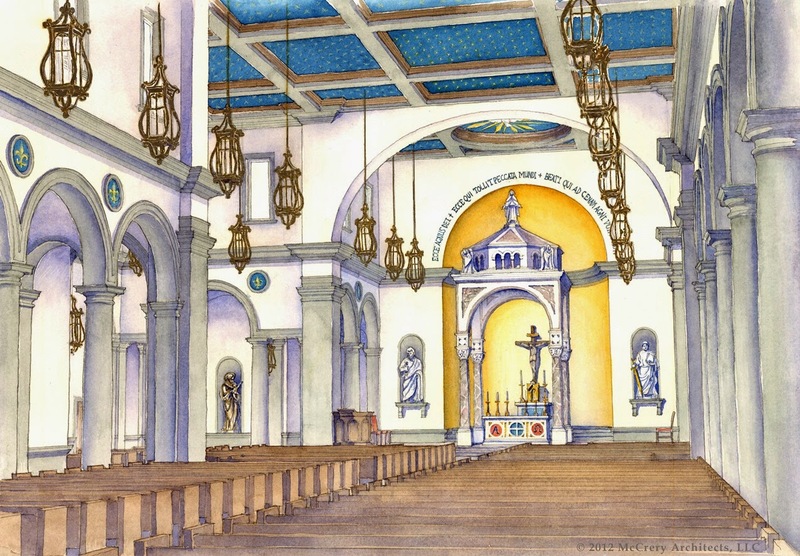 On February 2nd, the feast of Candlemas, His Excellency Robert Guglielmone, Bishop of Charleston, South Carolina, will dedicate the church of St Mary, Help of Christians, in the city of Aiken. The ceremony will begin at 6 p.m., and be celebrated in the Ordinary Form; the church is located on Fairfield Street, just north of Park Avenue. The parish was founded in 1853, but has now grown to the point where the current church building is completely inadequate to the size of the congregation; the new building has the capacity to seat 1000. The design is entirely the work of McCreary Architects, who provided us with some images of their designs; the project is scheduled to be completed very shortly. We hope to provide images of the dedication ceremony shortly after it takes place; thanks to those who provided us with these images. 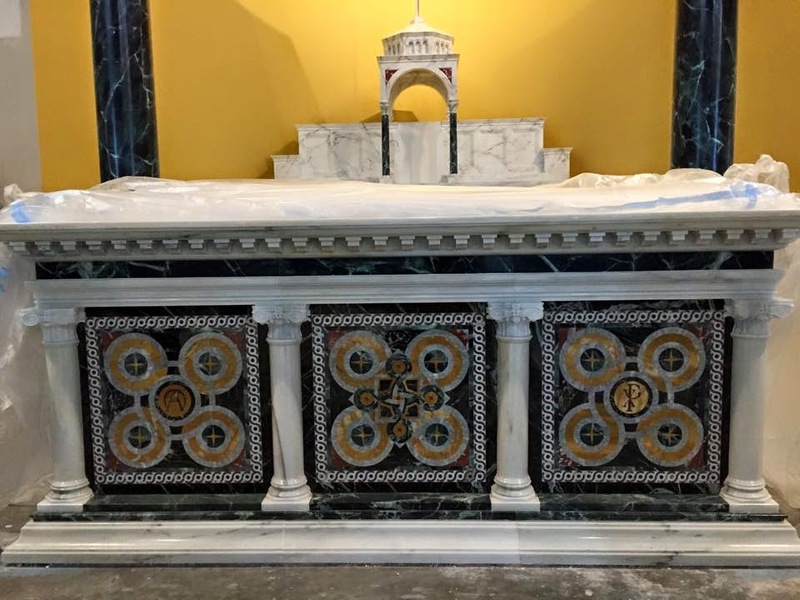 Update: Fr Gregory Wilson, the pastor of St Mary, has sent in photos of some of the church’s furnishing, which I have added below. Fr Renaurd West, a priest of the Diocese of Charleston, took these photos back in December; the works have of course advanced considerably since then. In my personal opinion, the mosaic work on the main altar is some of the best of its kind that I have ever seen in a modern church. 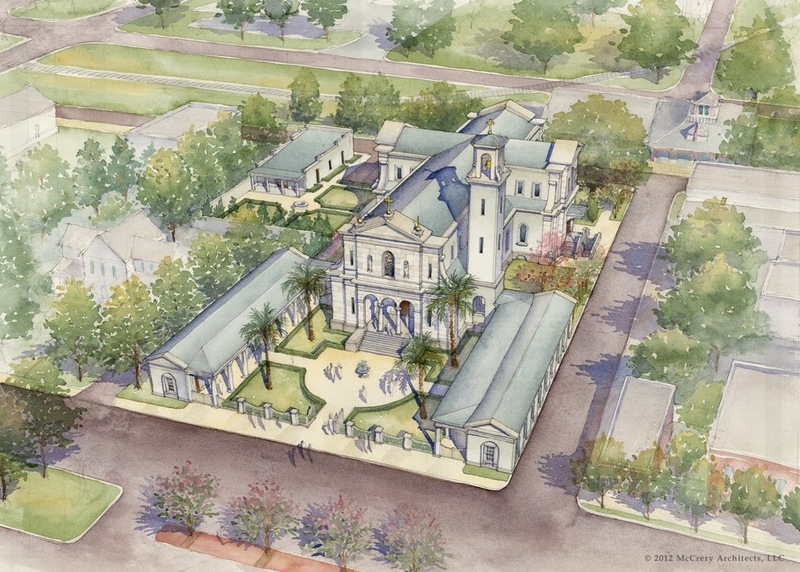 The architects, designers and clergy involved in this project are much to be commended for a beautiful church in a classical style which embraces and respects the Catholic artistic tradition. My last article about the music of Paul Jernberg and Roman Hurko provoked such a positive response I thought that readers might enjoy listening to this recording and video of Paul Jernberg’s sublime setting of the Salve Regina. It is on his CD featuring the Mass of St Philip Neri recording in Chicago by the Schola Cantorum of St Peter the Apostle. CDs and sheet music are available from pauljernberg.com. It was announced yesterday on the Bulletin of the Holy See that the Holy Father has erected the Eritrean Catholic Church to sui juris status as a Metropolitan Church, separating its territory from that of the Archeparchy of Addis Ababa (the capital of Ethiopia). The 23rd sui juris Church, which follows the Alexandrian liturgical tradition, will comprise four eparchies, covering the entire territory of the nation of Eritrea: the Archeparchy of Asmara, seat of the new Metropolitan and the national capital, and the Eparchies of Barentu, Keren and Segheneity. 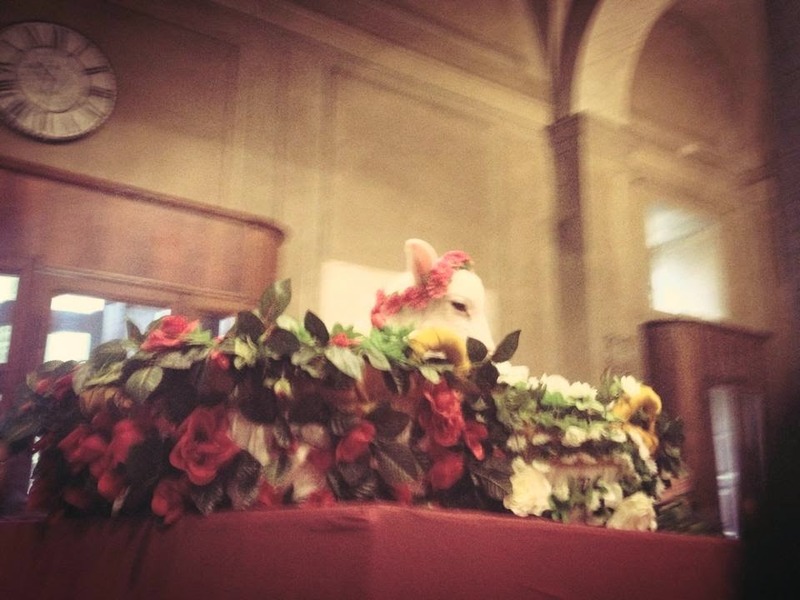 The Pope has nominated as the first Metropolitan His Excellency Mons. Menghesteab Tesfamariam, who has served hitherto as the Eparch of Asmara. In 1995, the Latin Rite Apostolic Vicariate of Eritrea was abolished, and so the Latin Rite Catholics of Eritrea are also under the spiritual jurisdiction of the new Metropolitan and his suffragans. The Pope has also created a fourth eparchy of the Ethiopian Catholic Church, that of Bahir Dar - Dessie, the territory of which is also removed from the Archeparchy of Addis Ababa. 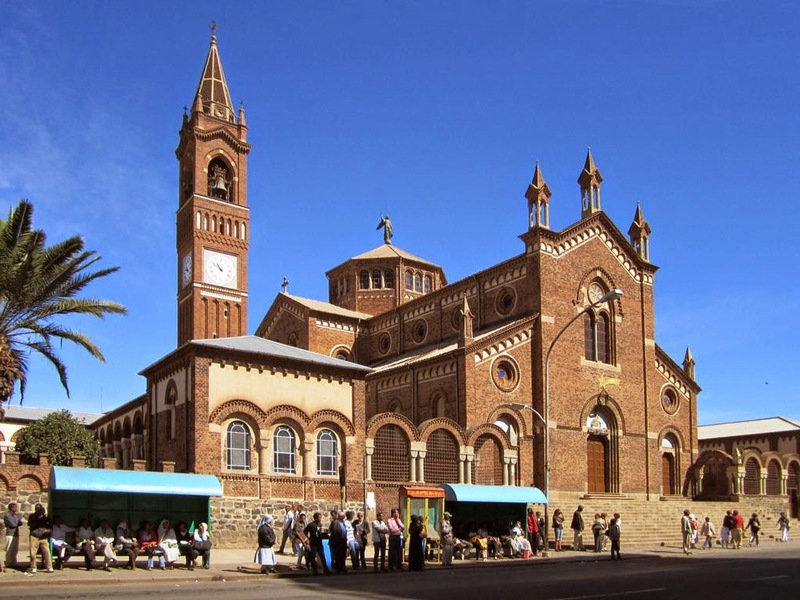 The Cathedral of St Joseph in Asmara, Eritrea. Image from wikipedia. by David Stanley. His Grace Abune Menghesteab Tesfamariam, the newly created Archeparch of Asmara, (in white vestments, and wearing a crown.) 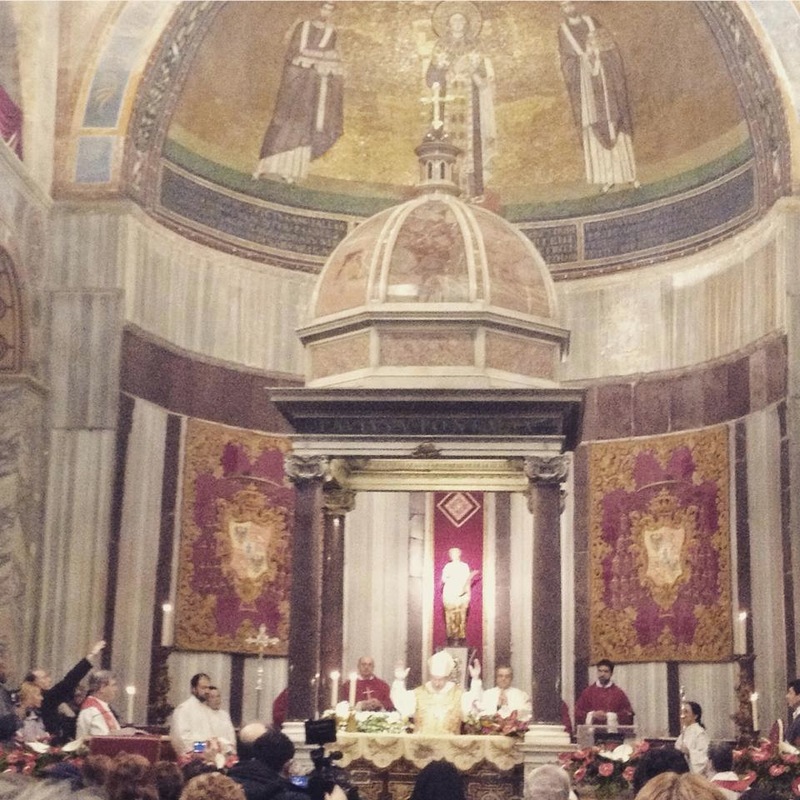 Image from the blog of the Eparchy of Asmara. As father of a family and an oblate of the Benedictine monastery of Norcia, I am truly delighted to be able to announce to NLM readers the publication of a new children’s book on the life of St. Benedict, written by one of the monks of Norcia, Br. John. Below are some photos and the press release from Ignatius. Let’s be honest: most children’s saint books are a combination of sentimentality, superficiality, and bad artwork, so when a very fine book like this one comes along, it’s a serious cause for rejoicing. Parents ought to snap up this one as quickly as they can. If Alasdair MacIntyre is right that we, in the worn-out West, are desperately looking for a new St. Benedict, it is going to be important to plant those Benedictine seeds early and deeply in the hearts of our children. SAN FRANCISCO, January 7, 2015 – Who would be better to write a story for children about Saint Benedict than a son of the Saint himself? Br. 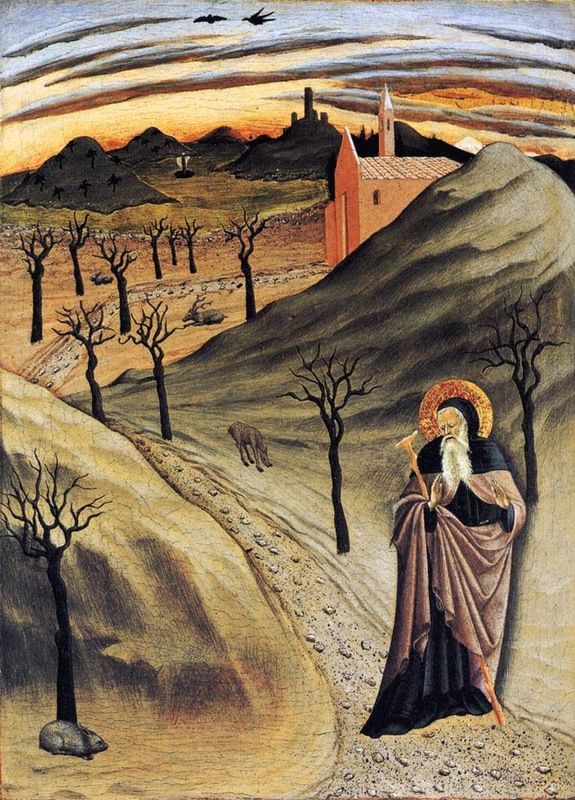 John McKenzie, O.S.B., a Benedictine monk from the Monks of Norcia, has composed a delightful story that captures the amazing life of this beloved saint, called The Life of Saint Benedict. Children and parents alike will be delighted by the lovely illustrations by artist Mark Brown, lay oblate of the monastery. Based on the biography of Saint Benedict by Pope Saint Gregory the Great, these stories and pictures are rich with interesting details. The holiness of Benedict, his wisdom, his great impact on the world, and his miracles will intrigue and inspire everyone in the family. Also included are stories involving his twin sister, Saint Scholastica. About the Author: Br. John McKenzie, O.S.B., was born and raised in Detroit, MI. In 2005 he entered the Benedictine Monastery in Norcia, Italy, the birth place of St. Benedict. 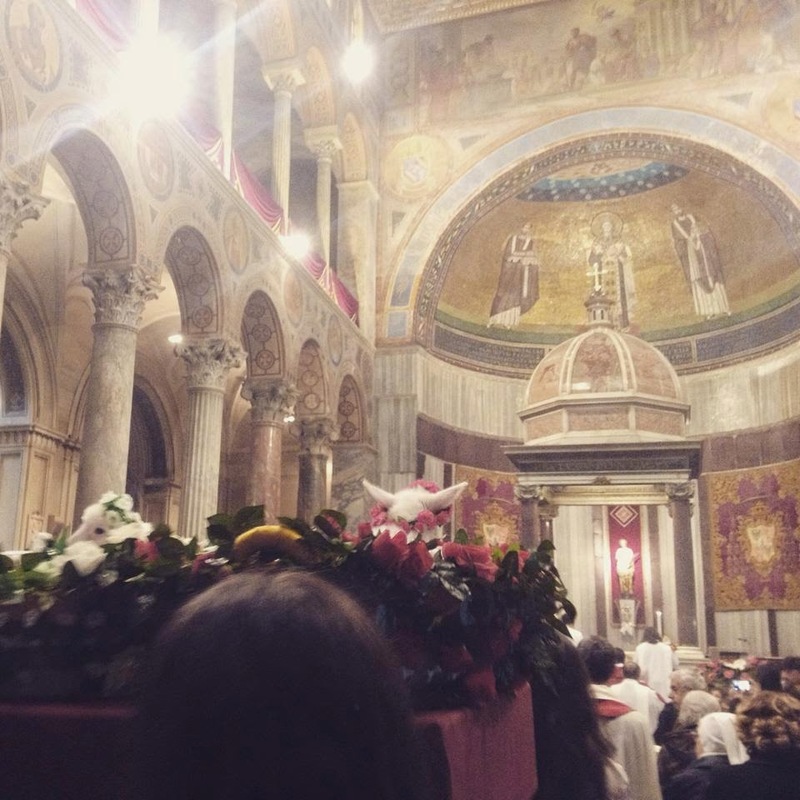 He made his solemn profession in 2009 and is currently studying theology in Rome. The website of the Milan Cathedral Museum has just posted this photograph of a beautiful 15th-century monstrance. The Italian version of the article is titled “Un antico intreccio di preziosità”, which has been rather oddly mistranslated in the English version as “An ancient twine of preciosity.” A better version would be “an antique work of varied precious materials.” Its date is uncertain, from roughly 1435 to the end of the 15th century; the vegetable motif in the stem is reminiscent of some of Leonardo Da Vinci’s architectural work. It may have been created as a drinking cup, and later transformed into a monstrance after it had been donated to the cathedral. The article on the website correctly notes that it is different from the more classically Roman form of monstrance, but this is not a particular feature of the Ambrosian tradition; monstrances of this kind were fairly common before the Counter-Reformation era. The subject of our recent quiz is the baptistery of the Marienmuenster in Diessen, Bavaria, a remarkable Baroque church dedicated to the Assumption of the Virgin Mary. It was built for a community of Augustinian Canons founded in the 1120s by the Counts of Andechs, after whom another monastery close by is named. (Kloster Andechs is quite famous in Bavaria as the place where a deservedly popular beer is produced, and also for the large brauhaus next to the monastery.) The current church at Diessen is the work of the architect Johannes Michael Fischer, in collaboration with many other artists and architects, and was constructed from 1732-39. Since the secularization of German ecclesiastical properties in 1803, it has served as the parish church of the nearby market town of Unterdiessen. Note that the side-chapels are all oriented in the same direction as the main altar; this is a common arrangement in Germany, whereas Italian Baroque churches almost always have the side-chapels perpendicular to the walls of the nave. A closer view of the high altar. The side altar dedicated to the Cross, for Masses of the Dead.